Like all creative personalities, sometimes I find it hard to get motivated. I've been collecting some helpful books that I would like to share. 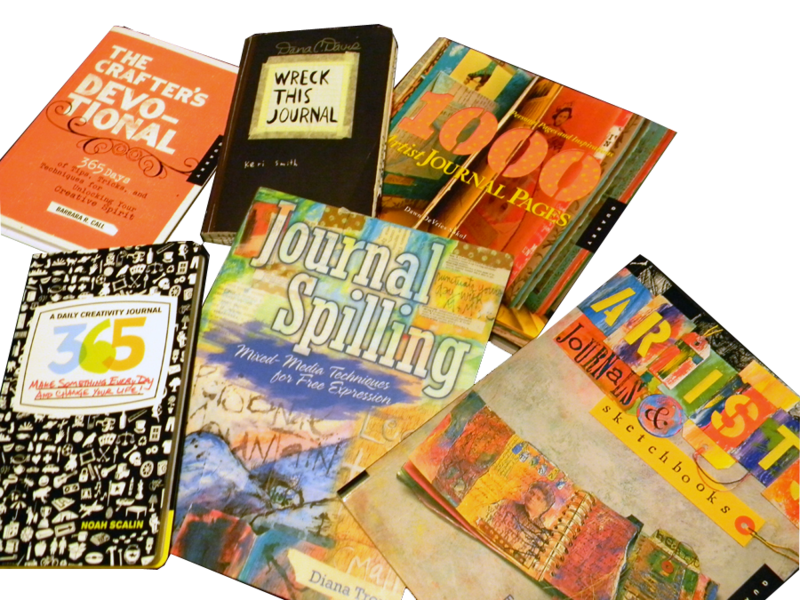 Artists Journals & Sketchbooks: Exploring and Creating Personal Pages by Lynne Perrella. This book re-sparked my creative juices (and eventually lead me to participate in the Sketchbook Project). I wish every book could be so packed full of useful information. 1000 Artist Journal Pages : Personal Pages and Inspiration by Dawn DeVries Sokol. Wreck This Journal by Keri Smith. This book teaches you to find inspiration in the wildest places and to step out of your comfort zone. Crack the spine, tear out the pages - nothing is taboo! Other books of note: "Mess" and "This is Not a Book" and the most recent "Finish This Book." A Daily Creative Journal: 365 Make Something Every Day and Change Your Life! by Noah Scalin. From the creator of the wildly popular project Skull-A-Day, Noah gives you a road map for how it's done. A book full of prompts for making something each day of the year and examples of how other people have done it. The Crafter's Devotional: 365 days of Tips, Tricks and Techniques for Unlocking Your Creative Spirit by Barbara R. Call. This book also has daily prompts, but it's broken down into categories. Journaling, Recycling, Collections, Personal History, Noncraft Inspiration and for the weekends - Collaborate, Gather and Experiment. Naturally, you could change their order to suit your needs. Journal Spilling: Mixed-Media Techniques for Free Expression by Diana Trout. Tips and tricks about paper, mediums and how to just "let go". I could list several others, but you get the point...find something that works for you and do it. If you are not willing or able to invest in the books - visit your local library. They would be happy to see you! Oh, one last thing before I go! Recently, I ran across a post from Real Simple about the 30 Days of Creativity (for June). The details about the project are on the Real Simple website, on Twitter or join up on Pinterest. Garner a sense of accomplishment. Conquer the fear of the unknown. Defeat the resistance that’s in your head. Save $ by being creative. Motivate friends and family to be creative too. Utilize the drafting table, DLSR Camera, Guitar you bought years ago. Show off and be proud of your creative work. Do something free of judgment. Get excited about new things. Use this as an excuse to buy a new (camera/screen printer/piano/etc). Until next time - Happy Creating and never stop looking for inspiration! I'll have to check out the Journal Spilling book!